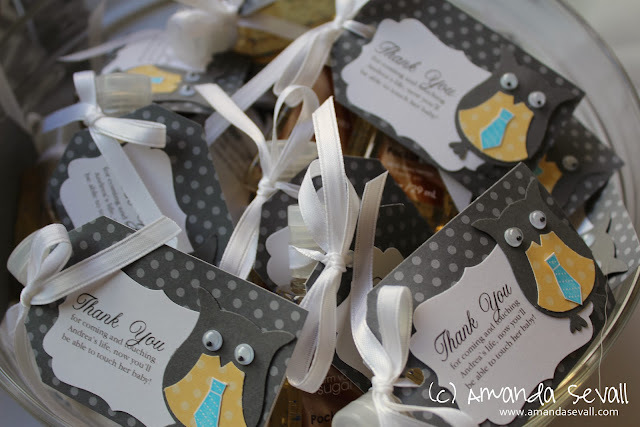 In October I had the pleasure of co-hosting a baby shower for my good friend Andrea. I'll share the details soon! She sent me this pin and asked if I could make something similar for her baby shower favor. The printed part of the tags were done in My Digital Studio by just typing it up, sizing it and filling a whole sheet of paper with as many as I could fit. They are so cute!!! I'm so glad that she wanted these and I love how they turned out! These are adorable! What a great gift for a shower. LOVE the little ties on the owls. So cute! Soooooooo cute!! I love love love those owls!!!! !